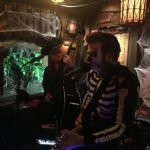 Slip and the Spinouts scared up some monstrous mayhem at the ninth annual Hulaween party at The Mai-Kai in Fort Lauderdale. 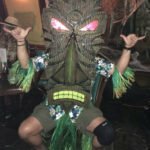 Living up to the theme “Monster Tiki Party,” the band and guests rocked for more than six hours on Oct. 27 in the legendary restaurant’s Molokai bar. 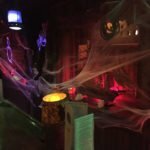 Halloween parties, themes and trends come and go. 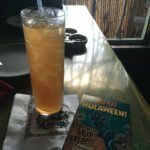 But The Mai-Kai and its annual bash serve as a festive mainstay, never failing to disappoint the retro-minded fans who flock to 60-year-old historic landmark on South Federal Highway. 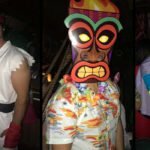 The costume contest annually draws a creative bunch of Tiki-loving guests who get in the spirit of the season with outfits that are both reverential and fun. 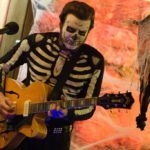 Amping the party up to 11, as usual, was South Florida rockabilly band Slip and the Spinouts, performing at their seventh Hulaween. Slip Mahoney and his tight, three-piece band performed three sets of classic roots rock and their own distinctive original tunes. 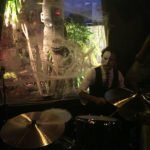 The trio of Slip Mahoney on guitar and vocals, Rodney Simioni on bass, and Dominick Daniels on drums were decked out for the occasion. 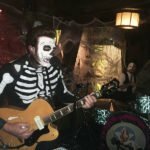 During happy hour and between sets, The Atomic Grog presented a playlist of retro Halloween tunes with a monster slant. Guests enjoyed a special event cocktail, the Appleton Monster Barrel, a premium version of The Mai-Kai’s famous Barrel O’ Rum featuring sponsor Appleton Rum. Also on the menu: The Flashback Friday cocktail Last Rites, a lost classic from the 1956 menu. 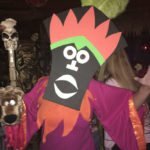 The Molokai, which already has a dark and spooky vibe with its widows looking overlooking flaming torches and ominous tikis, was appropriately decorated with creepy decor. 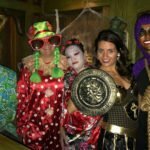 The Molokai Maidens, the bar’s distinctive sarong-clad servers, joined in on the fun with special make-up and costumes. 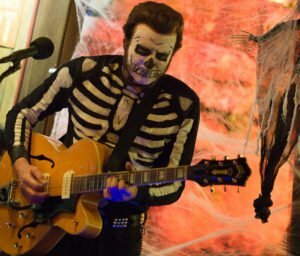 Hosting the costume contest, Mai-Kai manager Kern Mattei transformed himself into a latter-day Elvis. 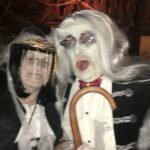 Marketing director Pia Dahlquist and owner Dave Levy also donned festive costumes. The judges picked five winners to receive cash and prizes. The Evil Monkey and Wicked Witch. 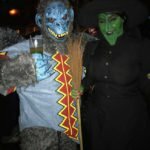 The Evil Monkey and Wicked Witch from The Wizard of Oz emerged victorious, a long-awaited win for the couple who previously competed as Beetlejuice and Lydia in 2015, and Beetlejuice and Miss Argentina in 2016. 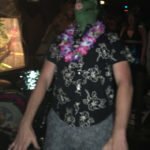 The runners-up in the costume contest were the Fallen Angels (second), Wonga Tonga (third), Frankenstein (fourth), and Lizard Guy (fifth). This year’s Hulaween poster (including some signed by South Florida artist Robert Jimenez) are available in the restaurant’s gift shop, The Mai-Kai Restaurant Trading Post, and online shop. Click here to order now. 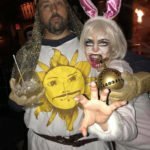 If you’re still feeling festive, it’s never too early to start getting your costume ready for next year and the 10th anniversary Hulaween party on Friday, Oct. 26. 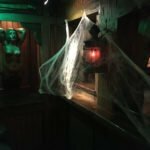 Cobwebs fill every corner of The Molokai bar. 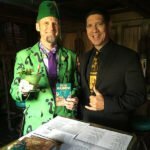 Manager Kern Mattei welcomes The Tiki Riddler. 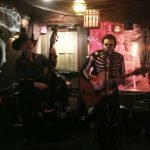 Rodney Simioni (bass) and Slip Mahoney (guitar/vocals) kick out the jams. 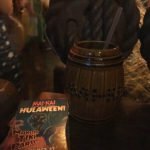 The Shrunken Skulls pay tribute to an iconic Mai-Kai cocktail. The Witch Doctor from Scooby Doo makes an appearance. 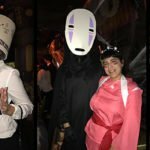 A selection of some of the many creative costumes. The Killer Bunny and King Arthur from Monty Python and the Holy Grail. 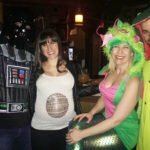 The bar was packed with costumes of every persuasion. 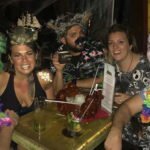 A motley crew enjoys a Mystery Drink. Revelers are treated to complimentary Appleton Monster Barrel samples. Spinouts bassist Rodney Simioni jams with guitarist/vocalist Slip Mahoney. 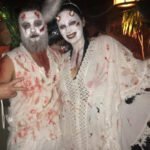 The Spirits of The Mai-Kai haunt Hulaween. Hulaween party characters included everything from fantasy, to Tiki, to mod (Mike “Jetsetter” Jones). 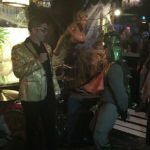 Lizard Guy, the fifth-place winner, greets host Elvis (The Mai-Kai’s Kern Mattei). Frankenstein is happy to be fourth in the costume contest. 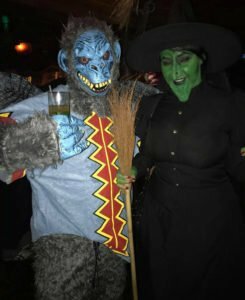 The Evil Monkey and Wicked Witch from Wizard of Oz swoop in to take the top prize. 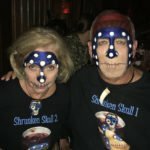 You may remember them from past Hulaween parties as the “Beetlejuice” couple. 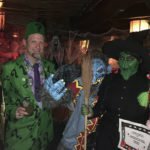 The Evil Monkey and Wicked Witch accept their best costume award and prizes from The Mai-Kai’s Kern Mattei (aka Elvis), The Atomic Grog’s Hurricane Hayward (The Tiki Riddler), and The Mai-Kai’s Pia Dahlquist (the kooky clown). 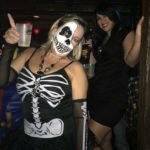 This entry was posted in Cocktails, Events, Events, Events, Events, Mai-Kai, Music, Photo galleries, Restaurants, South Florida and tagged Appleton, Fort Lauderdale, Hulaween, Last Rites, Mai-Kai, Molokai bar, Robert Jimenez, Rum Barrel, Slip and the Spinouts, South Florida. Bookmark the permalink.